Part of what we’ve learned during Better Sleep Month is how critical sleep is to our health and well-being, and that a full third of our lives are spent in bed. That makes the bedroom the most important room in our homes. One of the best ways to help you get to sleep (and stay that way!) is by making sure that your bedroom is dedicated to sleep and decorated to maximize relaxation to encourage quality sleep. This list of seven of the best tips for creating the ultimate relaxing and sleep-dedicated bedroom can help you to easily turn your bedroom into the haven of restful nights that you need to get better sleep and live happier and healthier. What kind of “vibe” do you want your bedroom to give off? Dreamy and airy? Dark and sensual? Before you launch yourself into decorating your sleeping space, set aside some time to consider how you want the room to feel. You want to create a sanctuary of sleep and peace, while also embracing your own style. Once you’ve settled on a “sleep vibe,” the other choices that you’ll need to make to create your sleep oasis will be much easier! When picking out the colors for your bedroom, make sure to think smoothing, not bright and jarring. Go for soft and more muted shades, such as neutrals and pastels, and if you decide you want a darker color scheme, focus on more calming shades – think navy blue, not electric blue. You may want your bedroom to look impressive, but remember that it’s a room for sleep, not show. Keep the amount of throw pillows to a minimum, and try to use no more than four pillows for sleepy time. If you feel the need to add some extra pizazz, add a couple of decorative pillows to top it all off – just remember to take them off the bed and store them to the side before turning in for the night. Without a headboard, your sleeping space can seem a bit incomplete – you’re left with just a mattress on a frame. 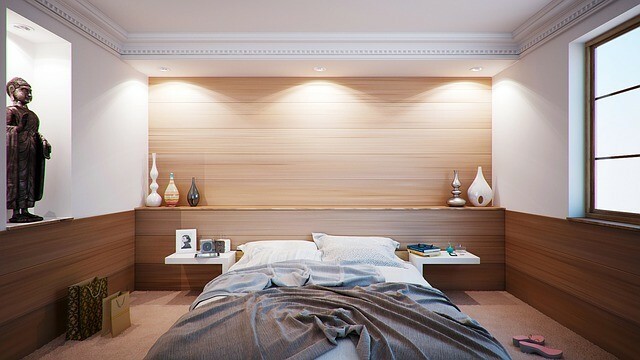 Whether you choose an upholstered, wooden, or even a metal headboard, this simple addition can make your bedroom feel special and more complete. Adding matching tables and lamps to either side of your bed can add a more polished and put together feel to your bedroom, and symmetry has been shown to induce the feelings of confidence and purpose. When it comes to creating the ultimate space for restful nights, don’t rely only on the overhead light fixture in your bedroom. Think about adding the symmetrical bedside lamps mentioned in the previous tip, and if your bedroom is large enough, you can also add an additional source of light elsewhere in the room, such as a floor lamp or a table lamp. Just be sure to keep the wattage of the bulbs that you use low! Your goal here is to create a soft, intimate light scheme to help encourage relaxation and (you guessed it) sleep. Hanging some curtains or drapes in your bedroom is a quick way to warm up the space mentally and physically. They also add depth and drama to the room, when they are long enough to reach from ceiling to floor. And, of course, they help keep out sunlight and even street noise, if they are thick enough, adding even more sleep-inducing components to your brand new haven for sleep and relaxation.